Happy New Year 2018, dear reader!! I was at ASICON 2017, Jaipur (25.12.17 to 30.12.17), an All India General Surgeons' Conference, for official booth activity and, while conversing with a doctor about laparoscopic surgery and its steady growth in India, I asked him: "What next?" He replied: "Robotics in surgery!" Robotics, and AI shall have a deep impact on surgery and healthcare delivery. In fact, there is a big market for the 'Old-age companion robot' (or OCR)...by the way - this is my abbreviation and concept. Above image from here: click! However, the positioning ought to be about companionship through robots rather than care-giving for the elderly. Companionship is a broader term, which can include care-giving. Across India and the world, nuclear families are putting the elderly in a tight spot. Even fit elders face the challenge of loneliness. Earlier, in the joint family system, elders played the role of patrons of family life for their children and grandchildren. Today, there is a different scene: living together for grown up children and their parents may not be practical...for instance, the younger ones travel and live away for occupational reason,s or may want to be separate due to change in generational values. This is where robotics can provide the supportive and companionship role (including care-giving). So what can a robot do? a) To begin with, in the morning: the OCR (Old-age companion robot) can wake up the elderly person at a predefined time and remind him of the work or activity as entered by the elderly person himself or his doctor for the morning. For instance, the OCR (Old-age companion robot) can provide the wake-up alarm input at 7.00 am and wish him well for the day... perhaps the pre-recorded voice of his/her daughter can be used for the same, and remind him or her to do 20 minutes of kapala bharati pranayama exercise. b) The OCR (Old-age companion robot) can simultaneously play the elderly person's favourite compatible music from its robotic body while the gent or lady is doing the exercise and pranayama regime. c) The OCR (Old-age companion robot) may also be able to check the blood sugar reading through a pin prick from a particular slot...and provide the electronic reading. Similarly, by placing the finger tips the blood pressure and heart rate could also be measured. d) Sensors in the OCR (Old-age companion robot) should be developed so that a watchful eye is on the elderly person's gait, and breathing...if there are any abnormalities, the OCR (Old-age companion robot) can send an emergency ring/message to the nearest healthcare provider and relative. e) Taking medicines and food on time, is complicated by inertia, weakness, slight depression and forgetfulness of the elderly person. The OCR (Old-age companion robot) should be programmed to provide the reminder input for the same and confirm it to the caregiver or relative through auto sms. f) The OCR (Old-age companion robot) should be enabled to provide mobile telephony. This way the elderly person should only request the OCR (Old-age companion robot) to ring up the relative or children, thereby enabling easy communication. g) The OCR (Old-age companion robot) ought to also do small jobs such as bringing a glass of water! h) The mobile OCR (Old-age companion robot) would be very useful if it could be a multimedia device, providing access to internet, having a small screen for viewing TV or internet telephony and generally helping in accessing the world and communicating. i) Jokes, humour, small puzzles and stories (including news stories) provide uplifting interactive moments for the elderly, an OCR (Old-age companion robot) giving this fare will surely make the robot very relevant to the person. Elderly life among couples is further complicated due to irritability, inability to help one another due to personal health issues, and the presence of bad or reduced communication between the two. Thus, the OCR (Old-age companion robot) becomes handy for the elderly couple to meet their needs without getting into daily quarrels. 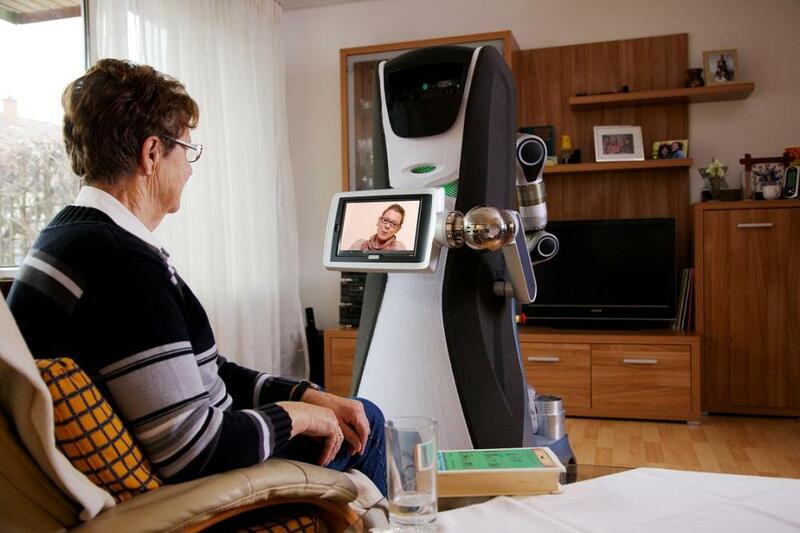 Care-giving robots is a higher concept; it is more interactive, clinical oriented and supportive. But the need is for firstly, the OCR (Old-age companion robot) concept, which helps make the elderly person's life easier, it need not be care-giving, the OCR should smartly be making the life of the elderly smoother and happier, filling the mental void and providing a moving smiling presence in the elderly individual's life. I hope robot manufacturers understand this need in the elderly segment, and declared 2018 as the year of OCR (Old-age companion robot) for elderly. Affordable models of such robots will surely be gifted by the children to their elders. This smart robot machine can make the life of elderly happier and easier, while soothing the sensitive hearts of their children. Kindly read all other blogposts here, and do recommend this blog to your acquaintances!